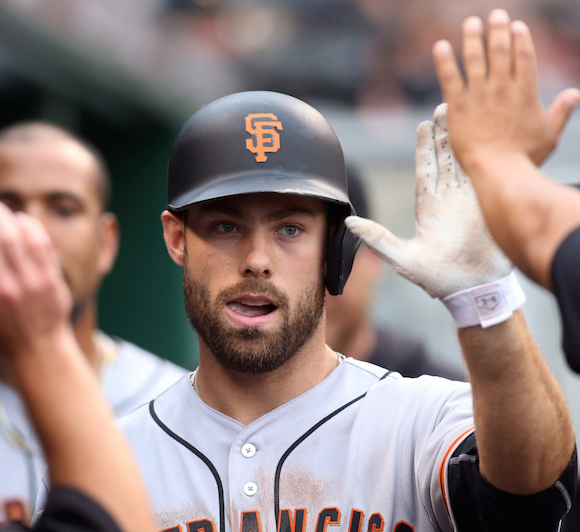 It wouldn’t be fair to write a recap of this game that read “MAC WILLIAMSON MAC WILLIAMSON MAC WILLIAMSON MAC WILLIAMSON,” mostly because several pitchers kept the Giants in it. But as they won their first game in the second half, snapping a six-game losing streak with a 2-1 victory that took 12 innings to achieve, they have to think that the last few days may have solidified Williamson as a foundation player for years to come. There was the home run in Fenway, along with an at-bat against Andrew Miller yesterday that Dave Flemming and Bruce Bochy both called one of the team’s best of the season. That’s why Williamson got a rare start against a right-hander today. But this afternoon he wasn’t just the player of the game, he was the game. And it won’t take much game for him to win over SNL’s Leslie Jones, if he so chooses. Jones, who’s in the recently released Ghostbusters remake, was all over Williamson on Twitter while attending her first Yankees game. What a day for Williamson. He committed an error, misplaying Mark Teixeira’s single which allowed Didi Gregorious to score in the fourth inning. Then he smashed a 420-foot homer in the fifth which landed in the back of the left field bullpen. He made a very difficult catch in enemy territory to stave off the Yankees’ threat in the 10th inning, leaping over (and into?) a fan to catch a Starlin Castro fly ball down the right field line. Now he has an actress with over 300k Twitter followers making him a household name because she thinks his blue eyes and neatly cropped beard are dreamy. This has been a bad road trip for the Giants, but it’s been an amazing one (6-for-14, three homers) for Williamson. I started off my Giants-themed day with a little pregame Marty Lurie. A fan called in to say she loves the Giants, but doesn’t understand why Bruce Bochy never bunts. Her assessment of Bochy’s strategy wasn’t kind, and Lurie seemed to agree. He didn’t DISAGREE, anyway. Santiago Casilla pitched extremely well to clean up Josh Osich’s mess in the 10th, but it also helped that New York manager Joe Girardi gave up an out at a time when the Yankees didn’t have any, as he had the sad ghost of Jacoby Ellsbury bunt runners to second and third. Bochy would never do such a thing, so even after Trevor Brown hit a leadoff double in the 12th, he allowed Grant Green to hit. Green grounded out to short. Should’ve bunted! Except Williamson came up and hit a 20-hopper through the middle off not-Betances/Miller/Chapman (in this case, a reliever named Anthony Swarzak) to put the Giants in front to stay. Did not bunting give the Giants their first victory in 13 days? No, but not bunting didn’t screw them over, either. And since most advanced statisticians agree that bunting is the hallmark of poor baseball strategy, and the players probably love that Bochy allows them to hit more often than not, I strongly disagree with people like the woman who called Lurie’s show today. — This isn’t about the Giants, but it was impossible to ignore what was going on with the White Sox during this game. Not a joke: Source says Sale blowup was because he didn’t want to wear throwbacks, so he cut the jerseys up so no one could wear them. It’s pretty awesome that a writer from “Fanrag Sports” broke a story about a crazy ace using scissors to snip every jersey in the clubhouse because he found them uncomfortable. — Chris Sale doesn’t throw a cutter, which is weird considering the events of today. — Speaking of AL Central oddities, I’m not buying the Royals’ excuse for not inviting Johnny Cueto (and other former Royals who were on the 2015 team) to visit the White House. — Along with Casilla’s outing (it’s not too strong to say he made a statement today with his performance), Javier Lopez and Hunter Strickland were really impressive. On the other hand, Josh Osich can’t walk two guys in a row to start an inning. Maybe the Giants could send Williamson to the Yanks for Andrew Miller. On second thought, that’s too much for the Giants to give.